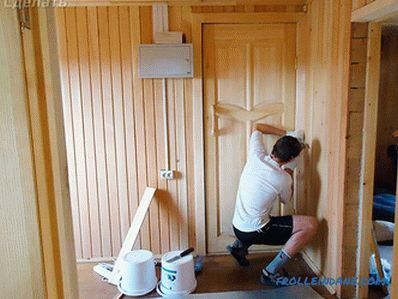 The traditional Russian bath is built of wood. 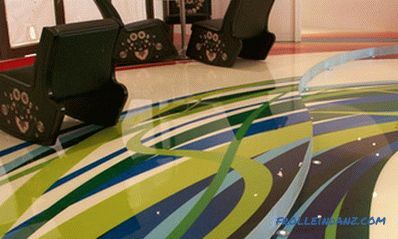 This material retains heat well and, when heated, releases healing substances into the room air. 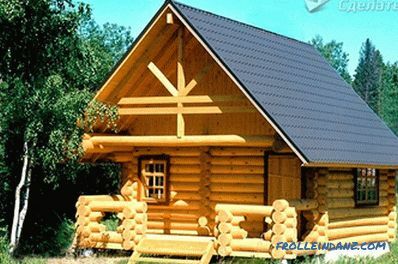 Properly processed and established log houses serve several generations. The ecological purity of wood, its vibrant energy and natural structure make the material popular, despite the high cost. This is a time-tested classic, not inferior to the position of brick, cinder block and other inexpensive building materials. A log bath can be built by a home craftsman who can handle an ax, a drill, and a saw. 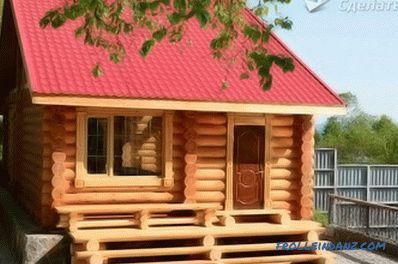 This process is not very complicated and quite feasible on its own, but to build a log house is better to invite assistants. 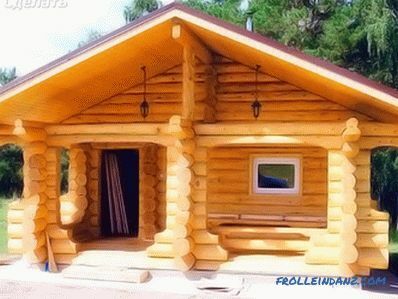 The raw material is cheaper, but after the construction of the log house will give a significant shrinkage. To build a reliable bath, which will last for many years, it is necessary to have wood harvested in winter, free of bark and sufficiently dried. 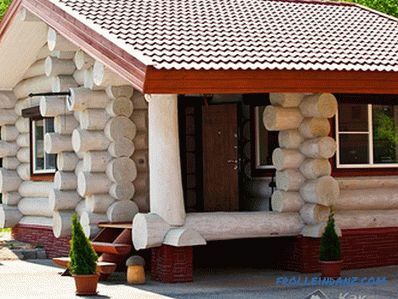 A log house of such logs can be operated for 50 years. 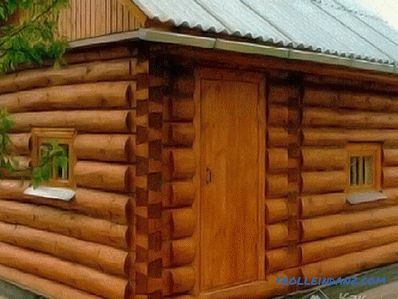 Rough logs are used in the construction of the bath, since the log houses make beautiful and neat. These are sawed tree trunks, dried to a moisture content of not more than 18%, and received during machining the shape of a cylinder and a longitudinal groove. Coniferous varieties of wood are less susceptible to rotting from moisture, they are recommended for use when building a bath. 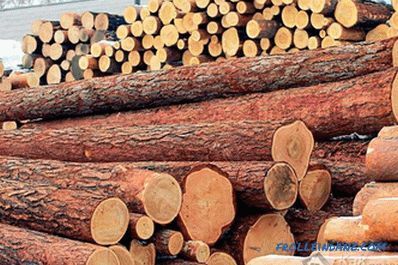 The most moisture-resistant round timber is taken on the lower crown - oak or pine. 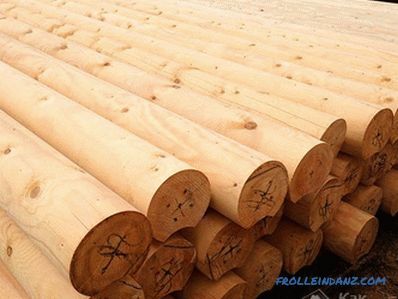 The diameter of the rounded logs ranges from 180 to 320 mm, thick blanks are used in cold regions. Available for sale a complete set of logs for a bath with numbered logs. This option will be more expensive, but it is built faster and easier. 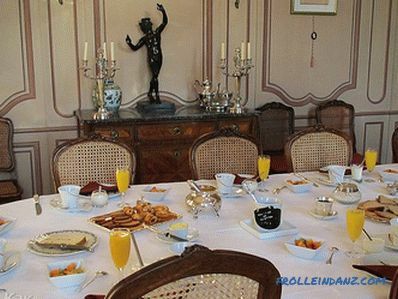 Examples of drawings of the bath with different size and number Rooms can be found on the Internet, and a large number of photos will allow you to choose a model for the soul. 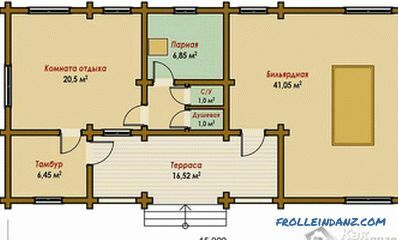 The drawing indicates the overall dimensions of the building and each room separately. 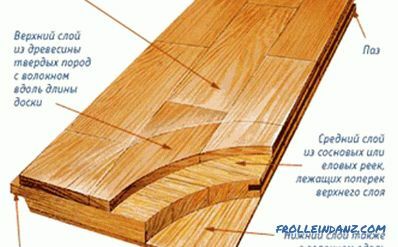 Based on the drawings, the number of logs, floor boards, and lining for finishing are calculated. Storing logs at a site requires stacking them in piles and providing ventilation. To do this, lay the boards between the rows. The basis of the bath is selected based on weight of the structure and type of soil on the site. 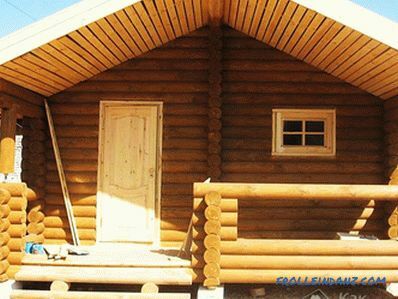 The most common options for wooden construction steel strip and columnar foundation. The tape foundation is a durable and versatile option, it is perfect for heaving soil with any freezing depth and will sustain the construction of several rooms. Having marked the place for future walls, they are digging trenches with a depth of 80 cm to 1 m. Sand is poured at the bottom, poured over with water and rammed to get a pillow. A layer of sand is 15 cm. Formwork is installed from the board, and fittings are laid inside it. The upper plane of the foundation bounces off the horizon. Concrete in the formwork is poured at the same time around the perimeter, this will allow you to make a monolithic base. 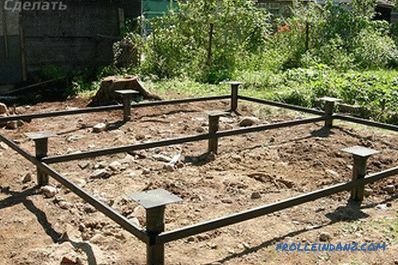 After drying, it is necessary to coat the foundation with bitumen and lay a roofing material for waterproofing. When installing piles for a columnar foundation, asbestos-cement pipes are used with reinforcement nested inside, which is poured with concrete. In the upper part there is an imitated log anchor. Walls begin with laying out the first binding ring. It uses the best wood, additionally impregnated with antiseptic. Under the crown stack insulation - jute, tow. Logs are located at an angle of 90 degrees and are connected by chopping into the bowl. 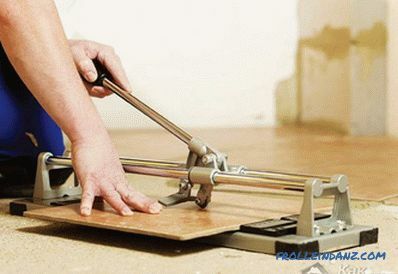 This method is one of many options, but it is easy to perform, which is very important for an inexperienced builder. For the connection in the upper part, a recess is cut down - a bowl that ensures a reliable fit of the material. The bowl is cut down with an ax and trimmed with a chainsaw. Diagonals inside the frame are checked, and the next row is put. For insulation, flax or tow fiber is used. 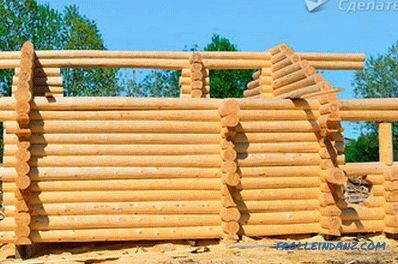 The logs are connected with the help of wooden dowels, for which they drill holes with an electric drill. In the process of building a log house, the verticality of the walls is controlled by the level. When the walls are raised to the desired height, the ceiling beams are laid down, the roof will rest on them. A common option is a gable roof and a small attic. 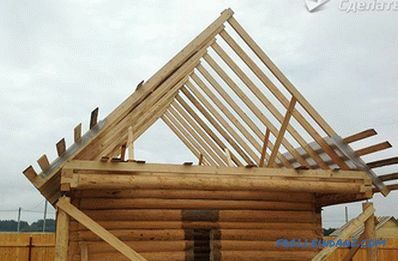 Rafters for the roof going below and rise to the roof.Rafter legs are attached at a distance of 1 meter and are connected at the top. On them the obreshetka for a roofing covering is stuffed. Under the crate attached vapor barrier. Cover the roof of the bath can be metal, slate, roll material. 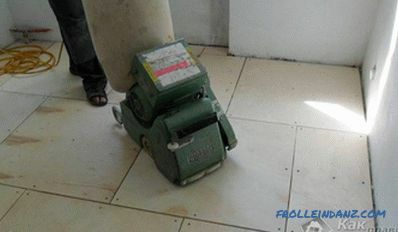 Rough floor must be installed inside the room with warming. The walls of the steam room are lined with clapboard, under which the foiled insulation is laid. It is necessary that when heated, the resin from the logs does not hit people. Finishing is made from deciduous trees. The outer part of the bath is good in its natural form and does not require additional finishing. Windows and doors are best to install after the final shrinkage of the log house. In the Russian bath of logs, folded independently, it is always warmer and more pleasant.